Let’s dive right into what the project is and what our goals are. Everland is a social online open world game. The intent is to provide players a space to relax, explore, customize their characters, unlock achievements, collect items, play a variety of mini-games, and make friends. Open World: Chat and explore a large open-world zone with your friends and new people you meet in game. A plethora of mini-games: be a DJ in a club, gamble in the casino, play board games with your friends, and much more. Own your own land: Show off to your friends and enemies by becoming an owner of one of the few mansions available in game. Other activities like successfully DJing for a crowd will earn you ingame currency to buy housing. These are just some of the features that you can expect, with plenty more to come in future updates. Currently we are still working to get a lot of base systems and work off the ground since we are starting from scratch. These are what all the departments have been up to over the last week. The networking team has been making a backend system that can horizontally scale no matter how many players we have. To help out with this we brought HNL (the creator of HNLbot) on board, and throughout the week he has been testing the backend with varying amounts of players. To get as many people as possible to test the backend we created a test web client that anyone with the link could join. The backend handled over 1000 players perfectly fine with the test web client! The success of the test web client has caused us to start implementing the actual game client using the backend now. The art team has been pumping out map assets like no other. We have a fantastic group of incredibly talented individuals who are very passionate about working on the project. We hope to complete the first zone within the next few days. Progress from here on out should be even more streamlined. Currently you can see some of our work featured on Byron’s twitter as well as here on the website. We are very excited to be creating something that we hope everyone will love. The design team has been brainstorming a huge range of features and areas for you to enjoy… a prehistoric zone to a pirate ship, and a medieval city, to name a few. We’ve had to design the core of what you can do in the game, how you interact with everything within and what sort of activities there are. With the core world having been designed we then started working on mini games and activities to do within the game. We’ve managed and continue to produce a large amount of mini games and some great activities to do. These range from classics such as collections, achievements, and poker, to some more unique concepts such as the band room with more to be revealed at a later date. We are still honing in on the feel of Everland’s sound. The first week of work involved a pretty blank slate for all of us which helped form some very creative work. We are currently developing sonic elements for our teaser and have begun work on different themes for our zones. 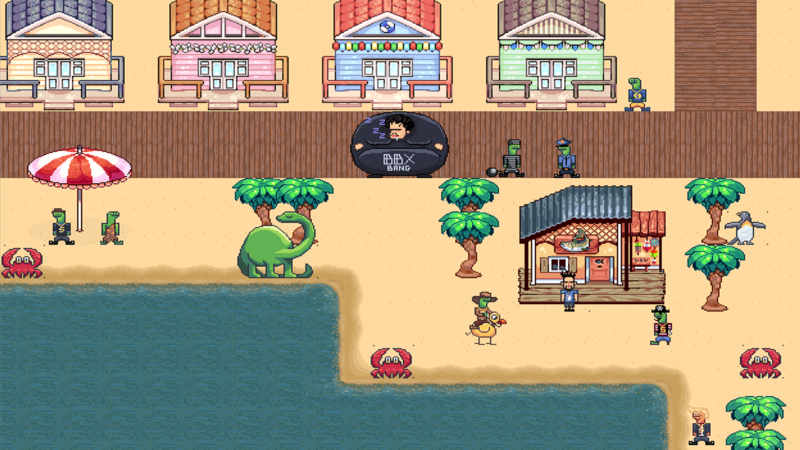 This week’s goal is to have our beach theme and elements in place for implementation. We are also still considering different audio solutions for the game but right now we are leaning towards working in AudioKinetic’s Wwise. That’s it for the first week folks! Copyright © 2018 Byron Bernstein. All rights reserved.